Slot machine giant Scientific Games Corp. said Thursday it closed out 2015 with a quarterly revenue fourth quarter revenue while the company sliced $231 million from the bottom line after completing the $5.1 billion acquisition of rival Bally Technologies. Accounting and financial activities surrounding the Bally merger caused Las Vegas-based Scientific Games to suffer a net loss of $128 million in the quarter that ended Dec. 31, which included noncash impairment charges totaling $130 million. Scientific Games, which operates in all aspects of the gaming industry, including slot machines, nontraditional table games, lotteries, and casino and lottery management systems, reported net revenue of $737 million in the quarter, 10 percent higher than the third quarter and up 4.2 percent from a year ago. 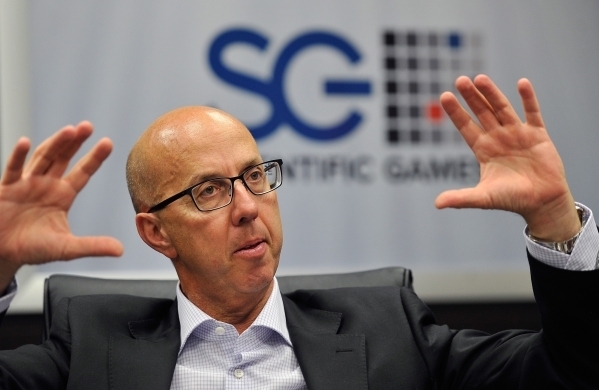 For the year, Scientific Games had total revenue of $2.8 billion, but reported a net loss of almost $1.4 billion, which included impairment charges. Scientific Games said it signed multi-year agreements to operate government-run lotteries in Denmark; Germany; Ontario, Canada; and Arkansas. The company’s lottery segment, however, suffered a 6.1 percent revenue decline in the fourth quarter. Scientific Games acquired Bally in November 2014. The company’s first quarter 2016 results will mark the first time the company reports a comparable three months of results since the Bally deal was finalized. The company said it reduced its total long-term debt by $33 million in the quarter, leaving the company with total debt of $8.2 billion at the end of the year. In a research note to investors before earnings, Union Gaming Group analyst Christopher Jones said concerns about Scientific Games’ defaulting on its debt are unfounded. He said the is a lack of lack of near-term maturities or any risk of liquidity shortfalls. However, any path toward a deleveraging in contingent on a broad-based recovery in gaming equipment sales.